Not long from now, I will receive an annual invitation I have always been unable to accept. The Golf Writers Association of America holds an awards banquet and meeting each spring. It always occurs on the Wednesday of Masters Week. The dinner is in nearby Savannah, Georgia, but the meeting is at Augusta National. As an Associate Member of the GWAA, that means I could be walking those hallowed grounds each year, if I could just arrange my work schedule to make the trip. It never works out that I can go, however, and this year’s no different. I probably won’t make Augusta until sometime after retirement from my day job. I’ll just pause for a moment here, so you can all recover from that emotionally devastating revelation. James Bartlett doesn’t have this problem, but I’m not bitter. He’s a long-time, full-time golf writer, who’s reported on the Masters Tournament on many occasions. 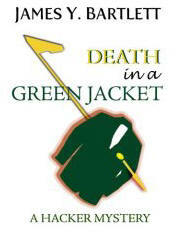 He’s taken advantage of those years of experience for his newest Pete Hacker mystery novel, Death in a Green Jacket (Yeoman Press; $14.99 SRP). As for the folks who run Augusta National and the famous major tournament, they might wish that Bartlett had a little less experience, and lot more innocent awe about the place. Hacker is a golf writer for a fictional Boston daily newspaper. He’s scheduled for his usual weeklong assignment at Augusta, about which he’s only marginally excited. As he explains in pungent prose, the fact that this major tournament is always held at the same place makes it hard for the regular golf scribes to gin up any enthusiasm for revisiting the same old story lines about this particular rite of spring. Think of Amen Corner, Bobby Jones, the club and the tacky stuff just outside its borders, the flowers, the pimento and cheese sandwiches, and all the other bits of Masters trivia that billow out onto the sports pages each year. Now think about writing on that same template each year, and you might appreciate Hacker’s point. Even so, it’s just a golf tournament, isn’t it? When a dead body is found in the famous huge bunker fronting the 10th hole, the head of press relations for Augusta reaches out to Hacker for some voluntary sleuthing about why a nice young local accountant would be found in such an inconvenient spot. Although he’s a well-known wiseacre, Hacker also has a reputation for calling it as he sees it. As shown in the prior three Hacker mystery novels, he also has a knack for being in the wrong place at the wrong time. Hacker meets the new Chairman of Augusta, and reluctantly agrees to follow up on this nagging little problem for the men in green jackets. Sometimes it pays to remember to be careful what you wish for. I don’t want to give away the main story line, because it is so much semi-malicious fun to read it. However, just think about three things–the special white powder ingredient Coca-Cola once had in its secret formula, Bobby Jones’s connection to the soft drink company, and the finance background of co-founder Clifford Roberts, whose mysterious suicide was out of keeping with his prior reputation. Bartlett also gives his readers several interesting side trips to other features of the Augusta area. A long-running tournament at an old-line golf course in nearby Aiken, South Carolina gives Hacker an opportunity to riff about the delights of a stripped-down approach to golf clubs and their layouts. A necessary visit to the “Terry,” Augusta’s down-and-out neighborhood, presents a stark contrast between that harsh reality and the fantasy world of Augusta National. Meanwhile, this being a Hacker mystery, that first dead body is joined by others—and someone is trying very hard to add Hacker to that list. It’s all so much fun. Go buy it soon, and enjoy.